Half of my grandkids came over on a recent Sunday, and we hit the trail for some berry picking. Mostly the red raspberries were ripe, and the black caps were just getting ready. The blackberries, growing on their dinosaur-sized eight-foot canes, ripen later in August. This year, the blackberry crop is off the charts. They go like that. A couple of average or lame years, then suddenly a boom! These thorny cane berries are related to roses. Actually, roses are a member of the raspberry family, and berry canes sport flowers that look quite similar in many cases. Cane fruits grow on biennial canes. The first year, only the cane grows. It then winters over, and the second year it flowers and bears fruit. You can tell what kind of year the next will be by assessing the number of bare, first-year canes in your berry patch. Accompanied as always by Chuy The Wonderdog, we wandered the trails, going where the berries led us. Big sister Maddie was also very helpful, showing the little ones where to find berries low enough for them to pick. Repeatedly trying to show little Evan the ripe, red berries. Evan, in typical toddler fashion, ate one of everything. 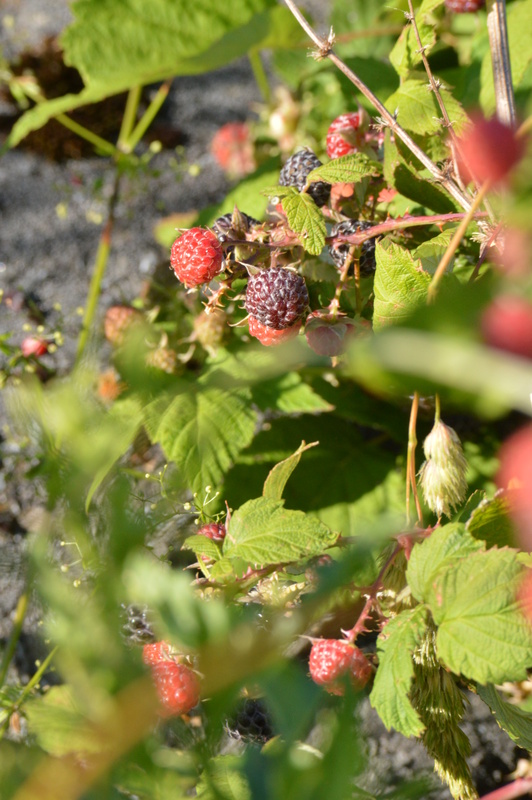 When my kids were little, we’d head out to the berry patches with cups and mugs and containers of all kinds, intent on collecting enough berries to make a pie. I’ve finally learned that when you pick berries with kids, the cups are just extra things to carry around, and they always come back empty. 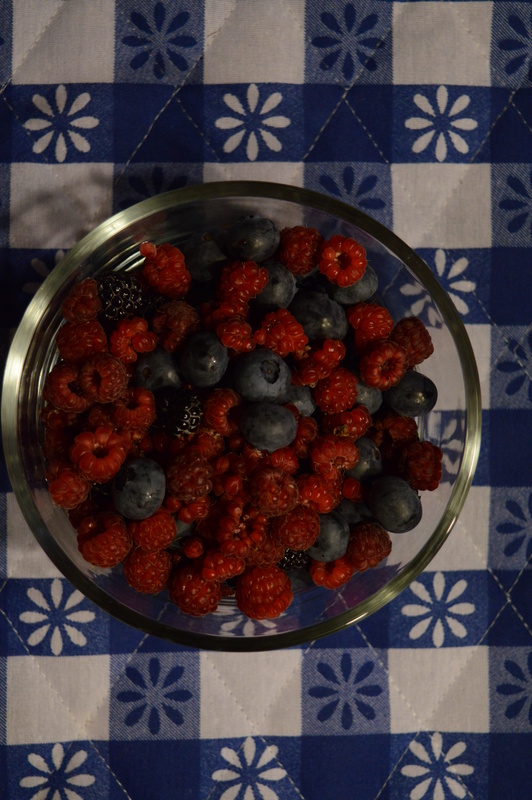 A kid would get a dozen or so berries in a cup and the temptation was irresistible. Munch, munch, munch. One year, with Max & Lizzy (two other grandkids), we actually brought enough blackberries home to make a skinny pie. Lizzy recalls that each year during berry season. We didn’t bring home any berries this day. But we did harvest some precious moments together. Next day, Chuy and I headed out with a cup, bound to fill it. I stopped by our little blueberry bushes and picked all 20 ripe blueberries. While Chuy waited impatiently, we stopped by the black caps, then finally some red raspberries, for a delicious medley of color and flavor. As our pinnacle days of summer continue, we’ll have the neighbors come over to help eat all these blackberries. Granted, we’ll have a little help from some birds and deer. This entry was posted in Sticks Life and tagged Berry Picking, Blackberries, Chuy, Family, kids, Nature Trails, Raspberries, Seasons, Summer on August 12, 2016 by Pazlo.